Load up your programs, hackers, it’s time to breach the mainframe and crack your opponent’s software with Android: Mainframe! Concepts: Set inside the same universe as the Android: Netrunner card game, Mainframe is a board control game for 2 to 5 players. Everybody plays as a hacker, running programs and striving to control as much of the board’s mainframe as possible. Every player controls a different character, which grants them three unique programs that they can run. Each turn, players will either be placing icons or boundaries around the board – the player who has seized the most land and marked it as theirs by the end of the game is the winner. Writing: Naturally there isn’t much in the way of storyline in this game. The rulebook is very well written and explains itself nicely, allowing players to dive right in. The instructions on all of the cards are clear and the text is easy to read. Each of the characters has a short biography, but it has no impact on the game. 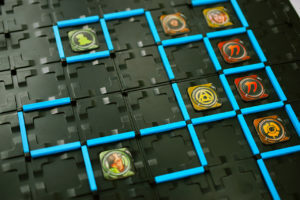 Mechanics: The game’s board is laid out in a grid pattern, with each square capable of holding a small cardboard token. The players each have eight of these tokens, which represent their character – these tokens are the player’s icons, and serve to mark the player’s territory. At the start of the game, each player places one icon anywhere onto the board. On each player’s turn, they may discard the top card from the draw pile in order to place another icon. Around each icon square on the board are thin indents into which can be placed borders – these borders are placed by means of programs, what we would call cards. On a player’s turn, if they choose not to place an icon, they can run a program – also known as choosing a card to play. At the start of the game, five cards are laid out at the side of the board, creating a market row. These cards allow players to build up borders in set specific patterns, move or swap existing icons, and so on. In addition, each player will have a hand of cards which are unique to their in-game character – these cards are often very powerful, but you are limited to only three of them. After a player chooses a program to run from the row, the row is filled back up to five cards from the draw pile. Play continues turn after turn, building up more patterns of borders, while players mark their territory on the grid, until the draw pile runs out of cards. Once that happens, it’s time to total up your scores and award victory to the best hacker. Design: So, the overall design for Mainframe is pretty nice. The board is fairly sturdy, and a matt black, whilst the borders are a lively blue. This gives a game a rather nice cyber-tech aesthetic, like you could expect when viewing the abstract hacking conflict inside the matrix. The art on the cards to represent the programs that each hacker can run is pretty nice, no complaints there. If anything, the biggest complaint that I have about the design is that it feels a little minimalist and unremarkable. Playability: Mainframe is a game which boasts a fairly simple design philosophy. It is not an especially complicated game to understand and is in many ways a standard board control game. Where it rises above that is in the unique cards that each player has, and the number of cards in the draw pile that allow players to move or swap other player’s icons. This creates quite a lot of scheming in the game, and means that you are constantly struggling to get the last upper hand on the other players. In a two-player game, this creates a great head-to-head chess match. In a game with five players, it becomes a rather savage free-for-all. 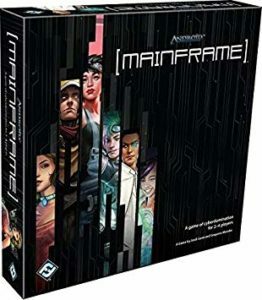 Conclusion: I have noticed online that a lot of players seem generally underwhelmed or dismissive of Mainframe, and I don’t think that’s particularly fair. Perhaps many have come to it with preconceptions based on experience with Netrunner. But Mainframe offers not only an entirely different gameplay style, but one that allows for very strategic and enjoyable play in its own right. One major downside that the game had at launch was its price point, but if you are able to find it at a considerable discount like I was able to, you will find it to be quite a good purchase. I have never failed to enjoy a game of Mainframe. 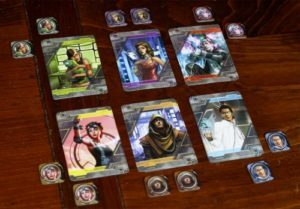 FINAL THOUGHTS: Mainframe runs like a smooth and well-designed program and gives skilled runners a good test of their board control skills.